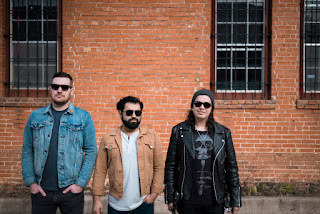 CORUSCO ANNOUNCE DEBUT ALBUM "WAKE" AND RELEASE SINGLE "NEW YEAR"
Texas three-piece Corusco have been flying under the radar the last few years while writing new music and performing around the country. Now, the band is thrilled to announce what they've been working on, their debut album "Wake", which has been set for release on May 25th, 2018. Along with the announcement, Corusco has partnered with GroundSounds for the premiere of their latest single, "New Year," a track that was inspired by a first kiss that felt as if it were plucked right out of a movie. "New Year" is one of seven tracks on the release that showcase the band's growth over the years.